It's only a few days until Infinity War opens, so let's review Steve Rogers before he gets killed off. Yeah, but no? Didn't he quit being "Captain America" at the end of Civil War? He gave back the shield, which kind of seems like the equivalent of turning in your badge and gun if you're a cop who plays by his own rules. You're a loose cannon, McGarnagle, and I've had enough! You're off the case!! Ahem. Sorry about that, I kind of got off-track for a second there. The point is, you don't drop the symbol of your station and wander off with your best buddy and still get to use the supranym. At least in the comics when the US government stripped him of his title, he just started going by "The Captain." Still, that may have been too much to ask of a simple name printed on a toy's packaging: the public knows Captain America, so you sell them Captain America. But then again, at least when he was "The Captain" he changed his uniform - can you imagine an MCU version of the USAgent outfit? Maybe that's what this toy is trying to show us, by making the colors so dark. Of course, the suit has been getting progressively daker through the films anyway: compare this to how he looked in Civil War and Urge of Altron, and you can really see that he needs a better laundry detergent. His blue is almost black, and his whites have gone grey. Even the red is so dark that it's almost indistinguishable from the brown of his boots. His transition into a filthy hobo continues apace. Surprisingly, however, this is not the same sculpt we've been getting for four years! Yes, Hasbro molded a completely new toy when they could have gotten away with just doing the chest. The lines of the suit aren't that different, after all, and we already got a recycled sculpt last time. If it was good enough for 2016, you'd expect it to be good enough for 2018; but nope! Color us surprised! The reason the chest would have to be redone is that he's apparently removed the star from his chest - there are sculpted slots where it would have once attached to his uniform, but now it's gone. 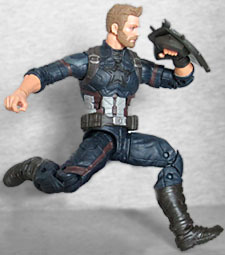 It's been seven years, six movies, and two cameos, and Hasbro finally managed to give us a Chris Evans likeness! ...and they got the hair wrong. 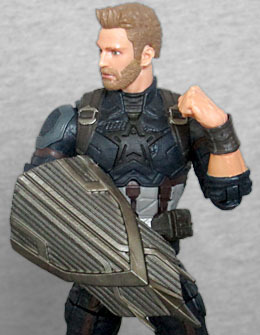 Every picture of Cap from the movie has has dark, shaggy hair, but the toy keeps it light and short. At least they got the beard right, huh? His transition into Solid Snake continues apace. Before realizing this was an entirely new sculpt, I was all set to say that the molds were wearing out: a lot of the joints are noticeably wobbly or surprisingly tight. Is he going to lose his left arm in the movie, like Winter Soldier did? If he does, good news: you'll probably be able to re-create the scene, because the toy's shoulder feels like it's ready to pop out, which means the arm tends to flop around a little. Not a lot, just more than Marvel Legends normally do. His ankles, meanwhile, are almost as stiff as Mattel's WWE figures'. So we get a new sculpt, but the articulation isn't up to the usual standards. Hopefully my figure is just a rare bad sample, and yours will be better. Due to costume changes, Cap is only wearing one glove, not two. That gets extra-weird when you give him his alternate hands, which are both closed fists: they're bare skin, meaning the one glove he is wearing suddenly turns into a leather cuff. His transition into a frat bro continues apace. On the normal hands, his left is shaped to hold the handle of his new Wakandan shield, while his right has the trigger finger extended. Presumably for a gun he doesn't include? The shield itself is made from soft PVC, which means you'll have to stretch his fingers open to get him to hold it, because the handle isn't sturdy enough to force them apart on its own. He's got a piece of this series' Build-A-Figure - it's Thanos' big dopey head. Put it on Cap's shoulders and make him look silly! 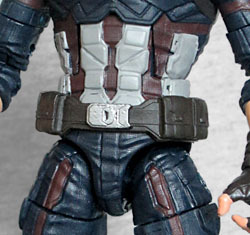 It's nice that Hasbro gave us a new sculpt for this toy, but him changing clothes for Infinity War, even slightly, implies that while he was hiding out in Wakanda, Steve got someone to make him a new costume that still fit with the "Captain America" branding. If they didn't want to go with the USAgent look, they could have done his other other heroic identity, Nomad - that would have fit the "man without a country" role he kind of has going on now, too.